Fig. 1: Antarctica (from NASA, 2007). The Antarctic tectonic region (Fig. 1) is located at Earth's geographical south pole, entirely contained by a ring of spreading rifts at the oceanic edges of large plates: the Pacific, Nazca, South American, African, and the Australian plates. 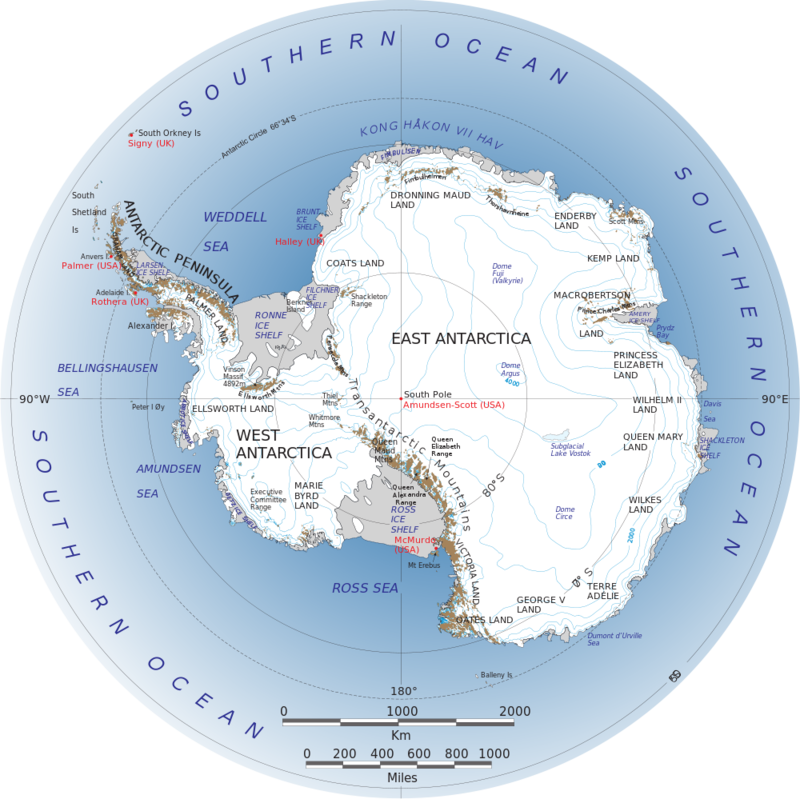 The Antarctic region itself contains the Antarctic plate, with East and West tectonic regions, and the Scotia plate, as well as the smaller South Sandwich and Shetland Plates (De Mets, 2010). At the time of the breakup of Gondwana, Antarctica began to rift away from Australia during the early Cretaceous (approximately 150 Mya) and later Africa during the Oligocene (Fitzgerald et al., 2002). 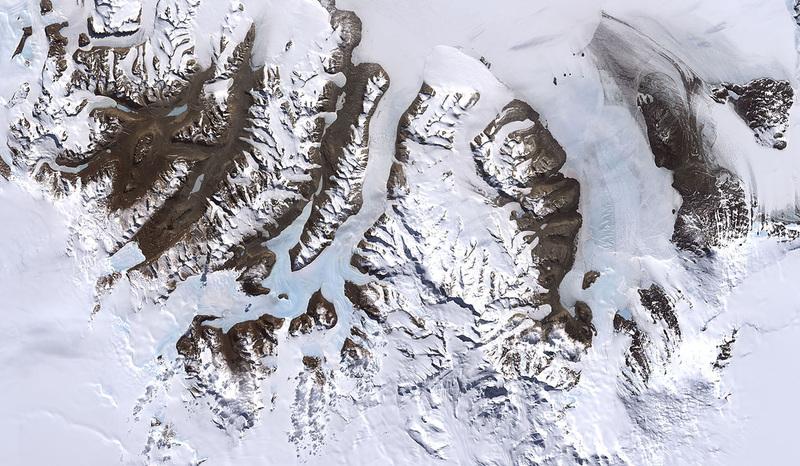 Antarctica's glaciation began approximately 34 Mya as one in multiple cooling events over the late Cenozoic. This is thought to be partially due to the opening of the Drake Passage, a body of water separating Patagonia and the Antarctic Peninsula (Scher and Martin, 2006; Livermore, 2005). The Scotia Plate lies beneath the Drake Passage, and is bordered on its northern and southern edges by sinistral transform faults; it is currently propagating toward Patagonia (Thomas et al., 2003; De Mets et al., 2010). Fig. 2: Seafloor elevation of the East Pacific Rise (altered after National Geophysical Data Centre, 2006); the plate partially outlined in dark red is the Nazca plate, while the rifting zone marked in white is the Pacific- Antarctic Ridge. Note the apparent curvature to the ridge, as well as the oblique angle to the ridge at which the accompanying transform faults exist. This indicates the likelihood of rotation of the Antarctic Plate relative to the Pacific Plate. N. B.:The visual landmass of Antarctica has been distorted in this image. The Antarctic Plate is defined by the fact that it can be separated into two distinct components: the West Antarctic, comprised of multiple partially-submerged microplates, and the large craton of the East Antarctic, which are divided by the West Antarctic Rift System, resulting in the 3500 km-long Transantarctic Mountains. The range is devoid of folding and constructed of only fault systems created by oscillating periods of transpression and extension approximately over the last 1 Gya (Fitzgerald et al., 2002). Fossil tectonic margins exist in the Antarctic region and can be observed as sea-floor ridges: the most noticeable are the Hero and Shackleton Fracture Zones (which forms the sinistral transpressional boundary on the southern edge of the Scotia Plate), northeast of the Antarctic Peninsula. They outline the edges of the extinct Phoenix tectonic plate, the southern edge of which broke and began to override plate towards the north, creating the currently-active Shetland Plate and a back-arc spreading ridge on the southern edge of it (Galindo-Zaldívar, 2006; Jin et al., 2009). Back-arc magmatism is also responsible for the formation of the Shetland Islands, as well as the South Sandwich Islands—the South Sandwich plate displays the same style of tectonics (Pearce et al., 1995). It has been acknowledged that estimations on Antarctic plate motion relative to the entirety of Earth is fairly loosely parameterised and rests on implications (Fitzgerald et al., 2002). Estimation of movement of plates within the Antarctic region since its separation from Gondwana is difficult; in spite of the presence of currently-active hotspots and volcanic regions in Antarctica, plate movement has been so limited over time that no hot spot-resultant island chains exist. An example is the 110 million year-old Kerguelen Plateau: its status as a localised igneous province is the result little motion of the Antarctic Plate over the hotspot supplying material to it (Duncan, 1981). Therefore, estimations of past plate motion are extrapolated from the motion of surrounding plates in conjunction with gravity anomaly maps, or elevation maps similar to Fig. 2. The direction of elongation of the Kerguelen Plateau indicates a general trend of dextral transtention along the West Antarctic coast and transpression along the East Antarctic coast, supported by the trend of gravity anomalies (Fig. 3), velocity vectors (Fig. 4), as well as the oblique angle of the extensional components of the fault to the corresponding transform faults. Fig. 3: Gravity anomalies in the oceanic plates surrounding the ice- and landmass of Antarctica. Note the arcuate traces of the transform faults (from Remote sensing tutorial, 2014). Fig. 5: A glimpse at the McMurdo Dry Valleys, Transantarctic Mountains (NASA, 1999). The amount of precipitation and humidity in this area is remarkably low, to the point that animals have been known to become mummified after death (Péwé et al., 1959). DeMets, C., Gordon R.G., Argus, D. F., 2010. Geologically current plate motions. Geophysical Journal International, 181, 1-80. Duncan R. A., 1981. Hotspots in the Southern Oceans — an absolute frame of reference for motion of the Gondwana continents. Tectonophysics, 74 (1–2), 29-42. Fitzgerald, P., 2002. Tectonics and landscape evolution of the Antarctic plate since the breakup of Gondwana, with an emphasis on the West Antarctic Rift System and the Transantarctic Mountains. Royal Society of New Zealand Bulletin, 35, 453-469. Galindo-Zaldívar, J., Maestro, A., López-Martínez, J., Galedano, C. S., 2006. Elephant Island Recent Tectonics in the Framework of the Scotia-Antarctic-South Shetland Block Triple Junction (NE Antarctic Peninsula). Antarctica: Contributions in Global Earth Sciences. Springer. Berlin, Germany, pp. 272-276. [Image] Jiang, W., E, D., Zhan, B., Liu, Y., 2009. New Model of Antarctic Plate Motion and its Analysis. Chinese Journal of Geophysics, 52 (1), 23-32. Jin, Y. K., Lee J., Hong, J. K., Nam, S. H., 2009. Is subduction ongoing in the South Shetland Trench, Antarctic Peninsula? : new constraints from crustal structures of outer trench wall. Geosciences Journal, 13 (1), 59-67. 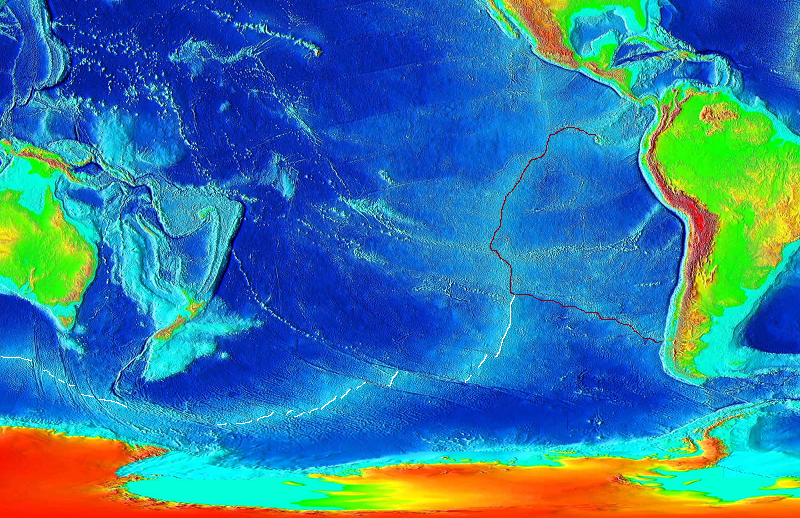 [Image] National Geophysical Data Center, Surface of the Earth: 2 minute colour relief images. (2006, March 12). Retrieved 28 January 2014 http://www.ngdc.noaa.gov/mgg/image/2minrelief.html Pearce, J. A., Baker, P. E., Harvey, P. K., Luff, I. W., (1995) Geochemical evidence for subduction fluxes, mantle melting and fractional crystallization beneath the south sandwich island arc. Journal of Petrology, 36 (4), 1073–1109. Péwé, T.L., Rivard, N.R., Llano, G.A., 1959. Mummified Seal Carcases in the McMurdo Sound Region, Antarctica. Science, 130, 716. Scher H.D., Martin, E.E., 2006. Timing and Climatic Consequences of the Opening of Drake Passage. Science, 312 (5772), 428-430. Thomas, C., Livermore, R., Pollitz, F., 2003. Motion of the Scotia sea plates. Geophysical Journal International, 155 (3), 789–804.